The Annexe provides an attack-resistant storage place for valuable items whether in the garden, garage, at your holiday home or even in playgrounds. Very sturdy, sound construction. Im very happy with this! It is ideal for storing bicycles and mountain bikes, toys, playground and sports equipment, tools and machinery, or as a general garden store - in fact anything that needs keeping safe and secure. 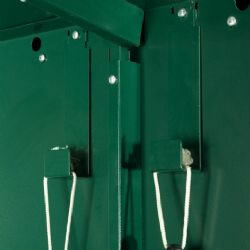 The unit bolts to the ground and provides a tough, reliable store that will genuinely deter thieves. 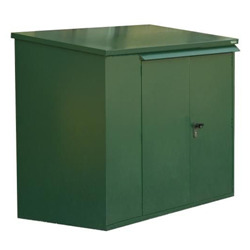 Although the Annexe unit is the same size as the Addition unit and appears the same from the outside, it has a number of extra security features designed to protect your valuable equipment. The doors and door surround are reinforced with 1.6mm thick steel box sections to strengthen the normal forced entry points and resist crow bar entry. All joints are double folded to increase strength and the base plinth is reinforced to prevent crushing when heavy objects are rolled over. The trap side is then bolted with 10mm steel bolts for additional security. The Annexe is certified by the Loss Prevention Certification Board to LPS 1175 Security Rating 1. Certified by the LPCB (Loss Prevention Certification Board) to Security Level 1. Asgard products come available in 3 different colours - dark green, ivory, and dark brown. Tick the colour choice box if you would like to select a colour for your product on the 'buy now' page. Simply screw into the Asgard unit for hanging items. 10 hooks are supplied.